There are three main reasons why we picked Slots Capital as our Best Rival casino: stability, trustworthiness and professionalism. Below there are few other reasons for you to check this great brand. 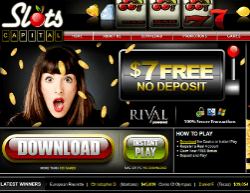 Slots Million is a multi-software casino with slot machines from over 10 software providers. We rate it only #2 on our Best Rival Casino list since it doesn’t offer full range of Rival slots, as Slots Capital does, but only 50% of them. 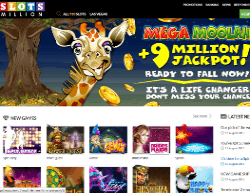 On the other hand, Slots Million casino is home to over 900 games from Cryptologic, Genesis, Microgaming, NetEnt, NextGen Gaming, Playtech, Rival, Elk Studios, 1x2Gaming, Saucify (BetOnSoft) and more. 100% up to $/€ 100 + 100 Free Spins. Restricted Countries: USA, Italy, Spain. 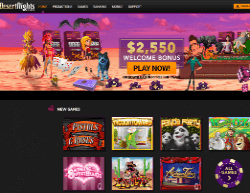 Desert Nights is a rather simple Rival focused online casino. It might look a bit too ordinary at first, but it treats players well, pays on time and have many bonuses and promotions. Full range of Rival casino games. Rival is one of the most popular casino software providers on the US market, second only to RTG. During the past few years, Rival decided that the US market is too small for them and started to expand globally, allowing players from all other the globe to try their popular slots. The most popular slots in Rival casinos come from the i-Slots series. These slots usually feature multiple bonus rounds, sets of reels and more. You should know that Rival slots tend to be quite volatile, so make sure you play according to your balance.